Goulds Vertical Turbine pumps cover a wide range of hydraulic conditions to meet virtually every pumping service in the industry with optimum efficiency. Goulds’ flexibility of design allows the use of a wide range of materials and design features to meet the custom requirements of the user. 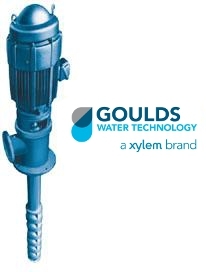 No matter what the need, whether low cost, ease of maintenance, optimum efficiency or tough service conditions, Goulds can make the pump to best satisfy the customer’s requirements. Sand collar prevents solids from entering the suction bearing. Hydraulic balancing of impellers to reduce axial downthrust and achieve longer thrust bearing life. Independent flushing of bowl bearings and wear rings for abrasive services.